This week, I will have a post reviewing each of the presentations from last Friday's Development Research Institute's annual conference. The posts will act as a summary of the points made by the presenters as well as some additional commentary and explanations. A group of those watching live-tweeted the event using the #DRI2011, so check out the tag to re-read some of the live commentary. As always, I welcome comments, thoughts and additions. Part 1: Easterly. Unfortunately, Nyarko was a bit rushed with his presentation due to a late start and an excellent opener by Easterly. What was lost was depth beyond what has become a common part of ICT4D discussions. However, these discussions do not seem to have reached everyone. For those who were gaining first exposure, I am sure it was an enlightening talk. Nyarko has a lightness that made his talk quite enjoyable and even a bit inspiring. To start, hetook down the notion that all of the focus should be on cell phones. 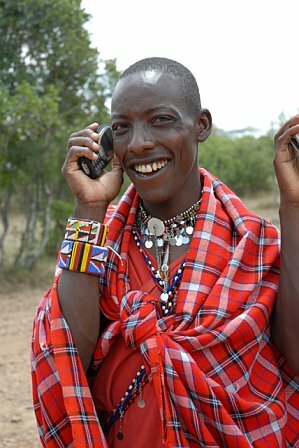 He began with the favorite image of the Maasai standing with cell phones. Although a powerful image of the cross between technology and pastoral, it is also simplistic. When looking at phones as a means to SMS and make calls, there are some opportunities, but internet applications are just plain foolish. The price of a smart phone is still to high and then you have to deal with data plans and working networks. In short, leave the iPhone apps at home. It is a long time before they will be effective development tools used by aid recipients. He sees innovation is possible with applications like SMS reminders and mobile banking, but glossed over my favorite example, M-PESA. However, depth was provided as he spoke of the ways that micro-insurance schemes can track rainfall in a region and make a mobile banking payment when rainfall is above or below a determined range. In the question and answer part Nyarko expressed a healthy amount of skepticism, but said experimentation is definitely needed. The talk was far too quick and I wish that I could share more, but I definitely suggest seeing Nyarko speak. I will end with the best thing I think that he said, "[People] want to do things themselves, teach them and let them do it." He spoke specifically about Africa in that comment, but it applies to and must become the mantra of international development. Yes, the fish analogy is said far too many times, but maybe that is because we are not listening to it. ICTs show a lot of promise, but the innovations should be more practical. It is one sector which can expose the ways that solutions can be derived from personal understanding and have no practical application in the target communities.